Hundreds of puzzles, 3100+ words and unlimited fun! 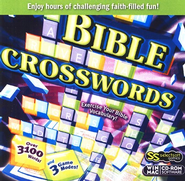 Enjoy hundreds of Bible-themed fill-in crosswords, based on the people, places and stories of the Bible! It's a fun and entertaining way to use your Bible vocabulary! System requirements: Windows 7, Vista, Mac 0S 10.3 and above.